If you like my work but want something designed and crafted especially for you, then don’t hesitate to get in touch! You can email me at gemmasangwine@yahoo.co.uk, and either arrange to meet up to discuss your requirements in person, or it can all be done online. I will make a note of the colour and style you want, then do mock-ups and email you photographs, and finalise the design from there, always bearing in mind your taste, style, and end use. I can also incorporate pieces of heirloom jewellery or fabric that you already have, to make it even more unique. Returning customer Rosie had a summer wedding to go to and wanted a saucer hat in neutral colours to match her dress. We picked out the silver grey colour from the dress and custom made the hat base in sinamay, adding ivory veiling and handmade lillies on top and underneath. 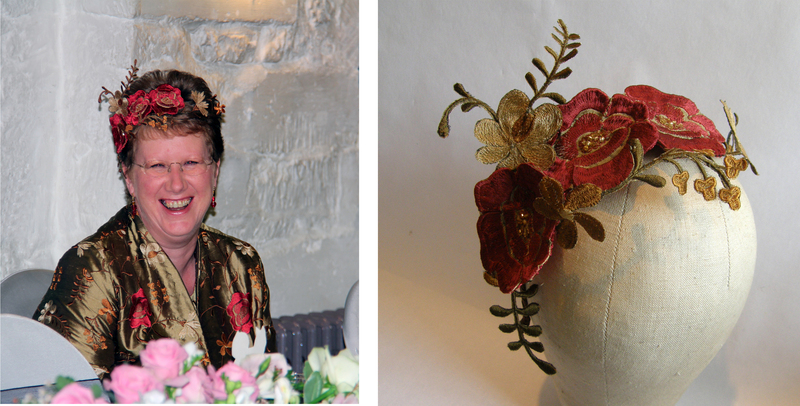 Mother of the bride Jacquelyn wanted a colourful, floral fascinator to go with her red dress. We went for handmade fabric sweet peas with a bit of sparkle with some wired diamante crystals mixed in, all set on a loose fitting ribbon covered headband which would be comfortable for her to wear all day. Harriet had a 1920’s themed wedding and wanted a simple, elegent headband incorporating original Art Deco diamante pieces with white feathers, all set on a ribbon covered headband. 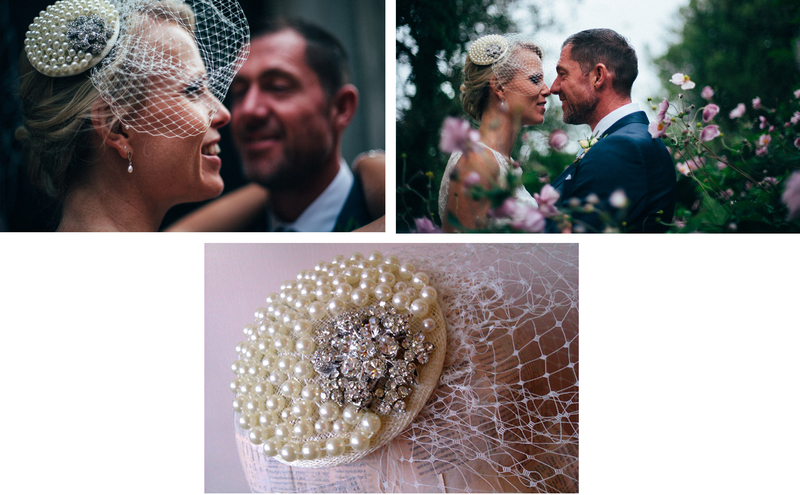 I was especially honoured to work with Harriet as she is a wedding photographer so had the pick of bridal accessories designers to choose from. Her Wedding photos are by Tammie Louise Photography..
Katy’s theme for her wedding was colour! We went with a bridal fascinator made with ivory and purple feathers, vintage diamante and faux fruit and stamens. Her belt is made with the same feathers, tiny sequins and beads to compliment her dress, and the centre piece is an heirloom brooch which matches Katy’s necklace and earrings. Helen, the mother of the bride, wanted a saucer shaped hat, so we started with a hand blocked and custom dyed straw base, which we trimmed with vintage fabric flowers and more faux fruit. The bridesmaids were wearing dresses in block colours and Katy wanted to gift them hair combs to compliment the dresses. We used dyed feathers and similar vintage pearl bead embellishments, to keep it simple. Wedding photos by Camilla Reynolds Photography, view more on her blog here. Trudy wanted a bridal fascinator in navy blue with accents of blush pink. She saw a design she liked at the studio, of a round sinamay base covered in lace and trimmed with vintage velvet leaves and diamante. I custom dyed the lace and velvet leaves, and we picked out the flower motifs, pretty lace birds and finished it off with a detachable veil. Bespoke bridal fascinator for Evelien made with vintage diamante and Pheasant feathers sewn onto a round sinamay base with a clip underneath to fix in the hair. The feathers were chosen specifically to match her custom made dress and embroidered belt. Martine wanted the piece to incorporate elements personal to her , including sea shells, freshwater pearls and flowers – the Frangipani flowers represent her early childhood spent in Mauritius – all twisted together with silver wire and a few diamante crystals to make a feminine and versatile hair vine. Suzi’s bridal outfit was inspired by the style of Audrey Hepburn in the film Breakfast at Tiffany’s. She chose a vintage dress and wanted a tiara hair comb to go with it. We used a vintage diamante brooch as the main motif, surrounded by graduated pearl beads recycled from vintage necklaces, which perfectly complimented her own jewellery on the day. 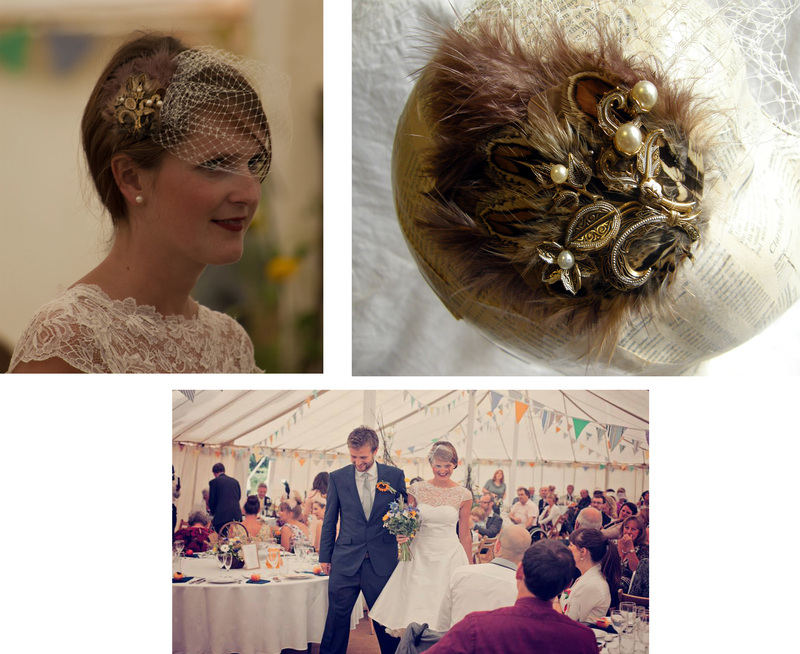 Alex commissioned a bespoke bridal fascinator with a combination of pheasant feathers and ivory feathers with copper tone vintage jewellery ( to match her wedding colour scheme) we also incorporated a feather Alex had collected herself which held special sentimental value. 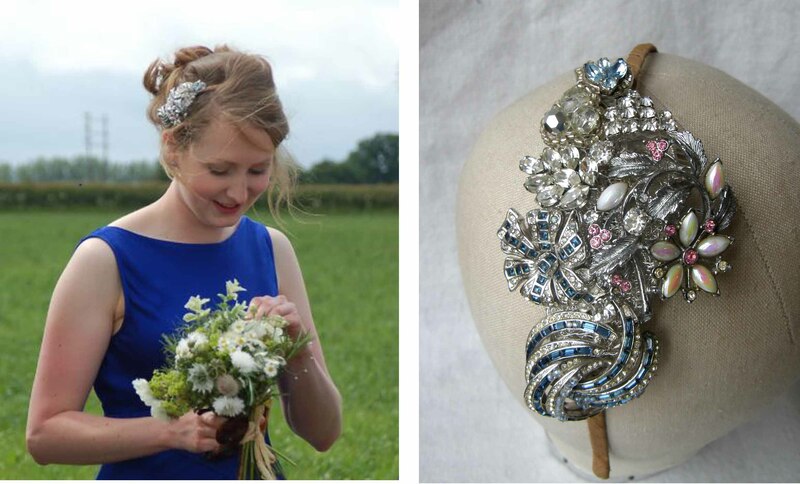 Laura commissioned a bespoke bridal fascinator to go with her beaded belt. 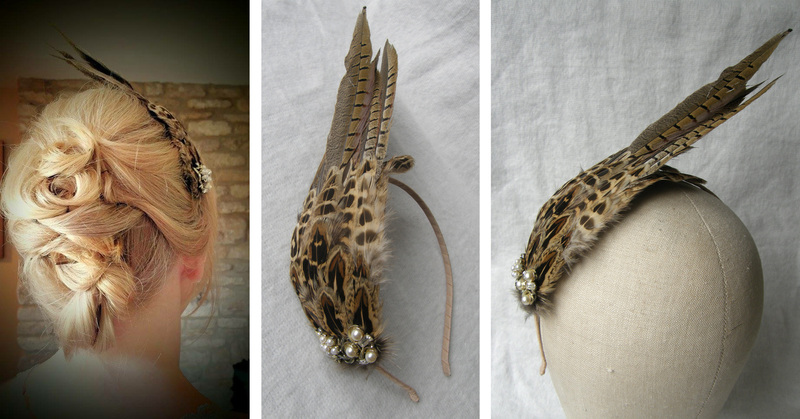 We used speckled Mallard feathers with vintage diamante, set on a fabric covered hairband to match her hair colour. Laura and Greg’s wedding was featured on Rock my Wedding. 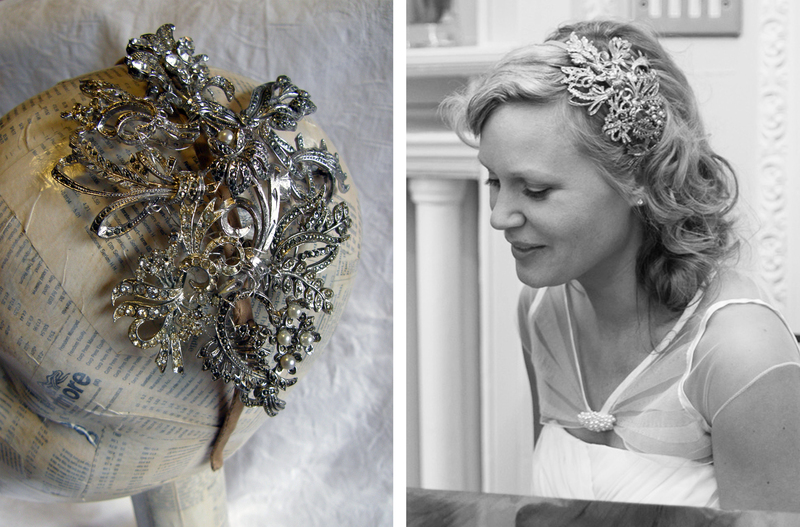 Laura S already had one of my bespoke hair pieces from when she was a bridesmaid at another wedding, so when it came to her big day she got in touch to commission a side tiara made with vintage diamante, and a detachable birdcage veil. She loved cameos so I incorporated one in the piece, along with a boat, and added extra pearl beads to match with her necklace. Bespoke hat for Rosie – hand blocked round beret base covered in ivory satin fabric overlaid with vintage lace, trimmed with wired lace and pearl beads. Rosie wanted a hat to compliment her guest at a wedding outfit, we picked out the navy and ivory fabrics to perfectly compliment her dress and jacket. Bespoke fascinator for Sarah, made with white goose feathers, vintage marcasite jewellery, cream satin roses and teal and blush vintage velvet leaves & flowers. Sarah wanted a hair piece to go with her outfit for guest at a wedding, so we used a neutral base and matched the trimmings with the colours in her skirt. The hair band was covered in cream ribbon to match her hair colour. Bespoke side tiara for Debbie, the Mother of the Bride. She had a 1920’s style dress and we were able to perfectly match the colours of it in the side tiara with vintage marcasite and coloured pearl beads. Bespoke bridal hair comb for Liz, made with goose feathers and vintage jewellery, including an heirloom brooch from Liz’s jewellery box. Her daughter was a bridesmaid and I made a set of four white satin fabric flower hair clips for her. Liz’s friend Sharon was maid-of-honour and we wanted something that would stand out against her blonde hair so we went for pheasant feathers, including tail feathers to give height, and added a couple of pieces of pearl & diamanté jewellery, to add a bit of sparkle and tie in with the colour of the bride and bridesmaids hair accessories. Bespoke bridal hair clip for Georgina, worn at the back of the head, hand made with vintage diamanté jewellery, pearl beads, and including a little something blue! 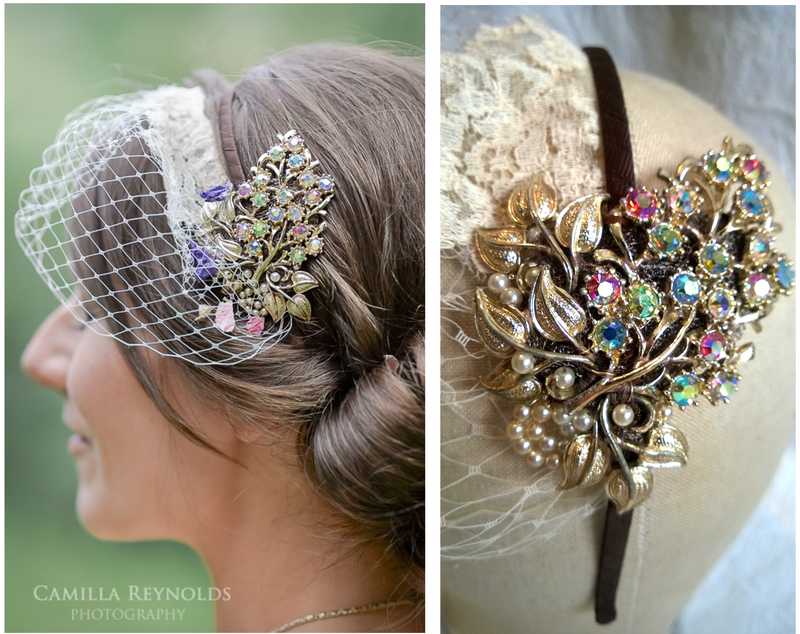 For her sister Emily I made a side tiara with vintage diamanté jewellery on a fabric covered alice band. Bespoke bridal side tiara with detachable veil and bridesmaids clips for Sadee, for her Las Vegas wedding. We used vintage marcasite jewellery along with some coloured enamel pieces to make up the side tiara – reflecting Sadee’s 1950’s pinup / tattoo artist style, and included a detachable veil. Her bridesmaids had pheasant feather clips with vintage jewellery, each one slightly different to reflect their personalities. Bespoke bridal side tiara for Rebecca, made with wired vintage lace and vintage marcasite jewellery on a fabric covered alice band, plus two bespoke bridesmaid’s hair clips made from vintage marcasite jewellery. Wedding photos by Carolyn Henry Photography. Bespoke bridal side tiara for Anna, made with vintage marcasite and gold tone jewellery on a fabric covered alice band, with matching bridesmaid’s hair comb. Bespoke bridal fascinator and keepsake bouquet for Caroline. Fascinator made with vintage jewellery on a fabric covered alice band, with a separate birdcage veil trimmed with lace from the wedding dress. Keepsake bouquet with handmade flowers (also incorporating lace from the dress), vintage jewellery and items of sentimental value. Wedding photos by Camilla Reynolds Photography. Bespoke floral fascinator for Jane, the mother-of-the-groom. Jane made her dress and coat herself, from embroidered silk fabric. I was able to use some of the fabric to make a co-ordinating floral fascinator, set on a fabric covered alice band to match Jane’s hair colour. Bespoke bridal fascinator for Sara, made with Pheasant feathers, Peacock feathers, vintage marcasite jewellery and an heirloom dragonfly brooch (which belonged to Sara’s Grandmother) on a fabric covered alice band with detachable veil trimmed with lace from Sara’s dress. Plus 5 x bespoke hair accessories for the bridesmaids, also using Pheasant and Peacock feathers and vintage jewellery. Wedding photos by Blooming Photography. Bespoke bridal fascinator for Clare, made with Pheasant feathers and vintage diamante jewellery, and a small birdcage veil. Bespoke bridal fascinator for Kate, made with natural Pheasant feathers and dyed brown feathers with vintage Toledo jewellery and a small birdcage veil. The dress is by Bristol based dressmaker Laura Davey. 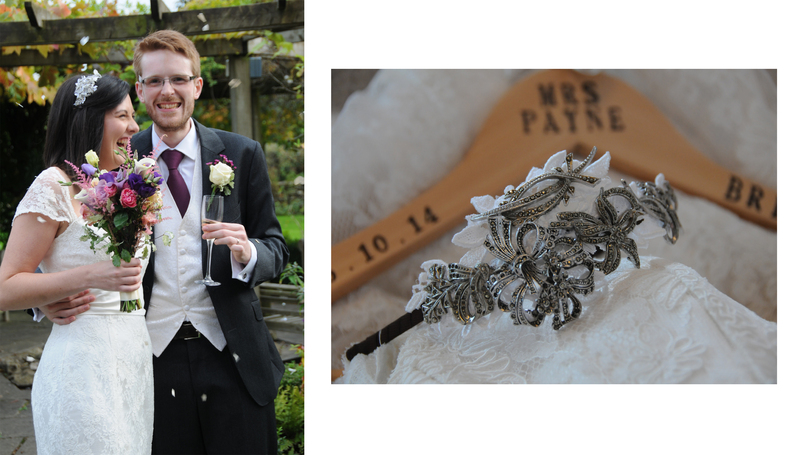 Bespoke bridal fascinator for Paula, made with vintage marcasite brooches set on a fabric covered alice band. The little chiffon bolero was also made to order by Bristol based dressmaker Laura Davey. Bespoke bridal fascinator for Emily, made with swarkovski crystals, beads and vintage pearls, with a birdcage veil worn separately. Bridal fascinator made to order for Justine. Ivory feather base with vintage diamante brooch, on a fabric covered alice band. 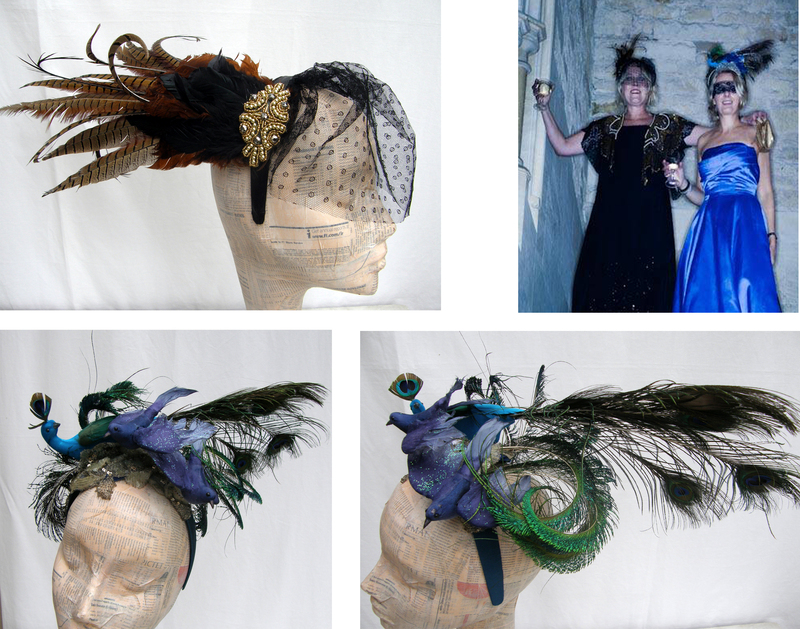 Three pieces made to order for Kathryn; bridal fascinator of mixed feathers on a sinamay base with vintage jewellery and veiling, and two bridesmaids fascinators of feathers and vintage jewellery on fabric covered alice bands. Mother of the bride piece made to order for Val. Pale blue feathers with vintage style diamante brooch on a fabric covered alice band. Bridal clip made with vintage costume jewellery and vintage strings of pearls mounted on a small sinamay base. Bespoke hair ornaments for Becky & Ali for the Masquerade Ball they organised at Woodchester Mansion. Becky’s piece is made with Pheasant tail feathers, dyed feathers, iridescent coque feathers, beadwork motif and vintage net on a fabric and feather covered alice band. Ali’s is made with Peacock feathers, feather covered birds and antique beadwork on a fabric covered alice band. My sister and I met you at the cheltenham vintage wedding fair and loved all your work, at that time we were not in a position to buy accessories, but have now got/ordered mine (bride), brisemaids and mother of the brides outfits and wondered whether it was possible to arrange to meet with you and show Mum your work, only we would love to find out about commissioning some pieces. Help I need a fascinator for my daughters wedding. I have seen your work and it is just what I’m looking for. My dress is gunmetal blue colour with a pale blush lining. The dress is a1920 style, your crystal, marquisate fascinators are amazing. I am looking for a bridal birdcage veil on a headband with brown and Ivory fascinator that will include copper tones and a full face birdcage. Can you help? Can you give me an idea of price please.